It was during Frieze week in London when the contemporary art world crashes rompingly over Londoners' traditional sensibilities. I was attending an arts related event dinner when I first encountered Ayman Baalbaki. 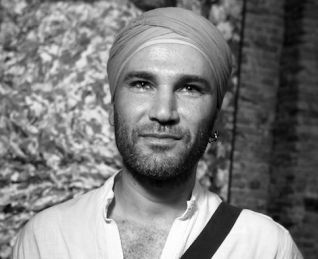 He stood out from the grey suits by his debonair silk scarf, reincarnated as a turban adornment for the night. His sartorial flourish reminded me of Dante Alighieri, a celebrated medieval scholar and poet of early 14th century Florence, whose signature headgear still finds resonance amongst artists, thinkers, and musicians of today. Indeed, upon entering the exhibit, one finds himself in a room replete with canvases showing the ravages and detritus of war projected squarely onto Beirut's urban landscape. The unifying theme in the exhibited works is desolation and abandonment. Sadly, the story is a well-trodden one for most Lebanese, who were either directly affected or displaced by the wars. The artist is a familiar witness to these cycles of destruction. He once lived in southern Lebanon and later in Beirut where the recent 2006 war also took its toll. 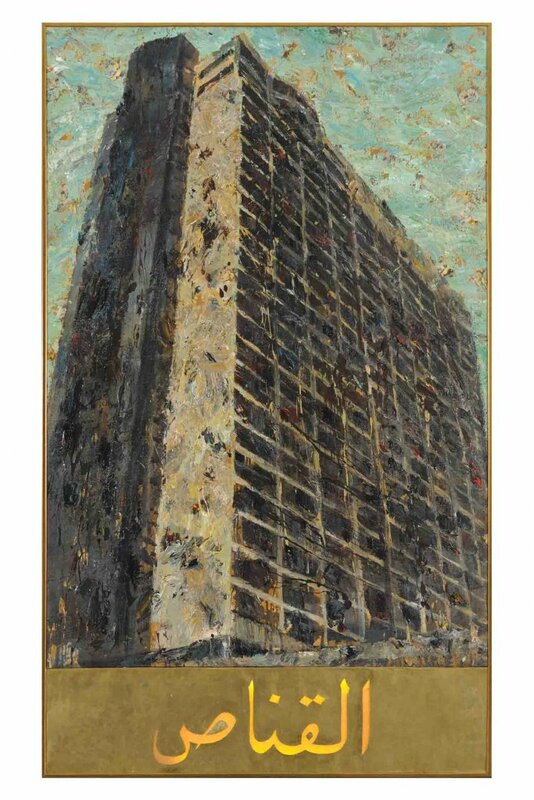 One of his works entitled “The Sniper” is a painting of an iconic building, the Holiday Inn Hotel in west Beirut. The hotel was a strategic high building that received direct hits from both sides. It was also the perfect sniper's nest for Lebanon's different militias. The artist painted the building in thick layers of oil, an impasto technique that uses a painting knife to carve up the layers of the canvas. Even though the impressionists used that style for enhancing colour and light, it is used here with dark colours to amplify the layers of destruction and fragility of the urban fabric of Lebanon. The Holiday Inn building still stands with its war-ravaged and unkempt face to remind the Lebanese of their recent turbulent history. Baalbaki deploys "the sniper" to anchor the show in the deeply troubled reality of Lebanon's past. Professor George Arbid, a professor of architecture at AUB currently writing a book on Beirut's modern architecture, mentioned, "…the hotel had a very short life because the war broke out soon after its opening. There are many horror stories about people being thrown from the top floors during the war. The owner is still trying to hold onto it as a landmark building that should be preserved and restored." Mona Hallak, a leading architectural preservationist is focusing her energy on another site near the Green Line, a no-man's land that became the fault-line between east and west Beirut during its civil war. The site is the Barakat Building in Sodeco. It will be reincarnated as the Museum of Memory, with its preserved sniper den. On this basis, Baalbaki's sniper building is guaranteed to live in another place under a new façade. Other buildings shown in the works are just faceless objects of destruction and stand testament to the haphazard ravages of war. Yet Baalbaki's soul still holds the promise of hope. The artist, in a similar manner to Dante's Divine Comedy, guides people on a voyage to Hell, Purgatory and back to Paradise. The background and sky of his canvases are in a vibrant floral palette, with touches of blue and red, representing the kitschy fabric of women's dresses in the villages of southern Lebanon. For Baalbaki, this human warmth imbues a vestige of life in his otherwise cold and dark portrayals. 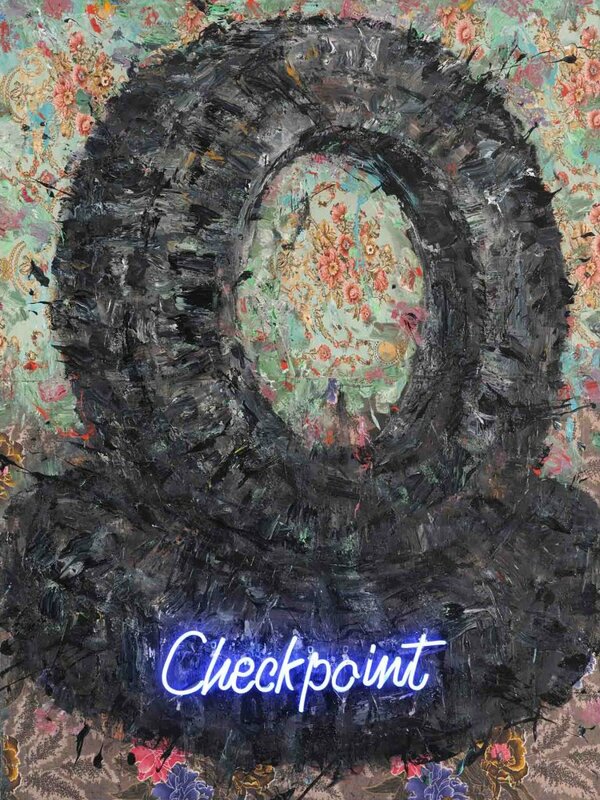 His neon lights are a reminder of the bustling Hamra Street in Beirut, inciting many of the attendees to express an ironically warm emotional attachment to such works. The artist is still subtly distant in his portrayal of war. His objective is not to stir, enrage and draw more fire to the heated debate. Perhaps in his measured detachment there is a desire to reflect his cynicism regarding confrontational politics in Lebanon. His father was once a member of the idealistic communist party of Lebanon, which was outlawed on many occasions. The communist party's rapprochement to Nasser helped instigate the first US invasion of Lebanon in July 1958. The Baalbakis have since moved on and abandoned their traditional politics and adapted themselves to Lebanon's politique-du-jour. 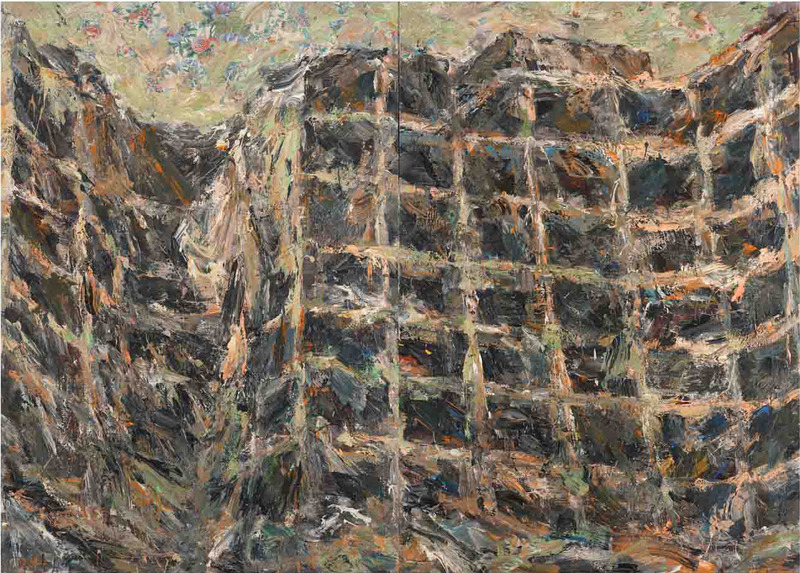 Drawing upon a parallel example, John Jurayj is another artist who uses the broken alphabet of Beirut's urban buildings in his painting narrative. While Jurayj uses abstraction, flairs and reflective perspex as artifice to create captivating scenes, Baalbaki is steady, letting his canvas laboriously invite his audience into his silent scenes. 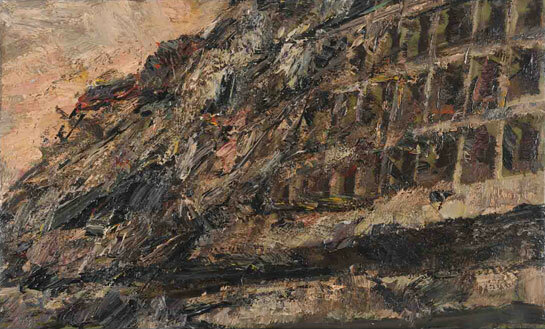 Baalbaki is an admirer of Anselm Keiffer, an artist with monumental pieces providing profound perspectives. 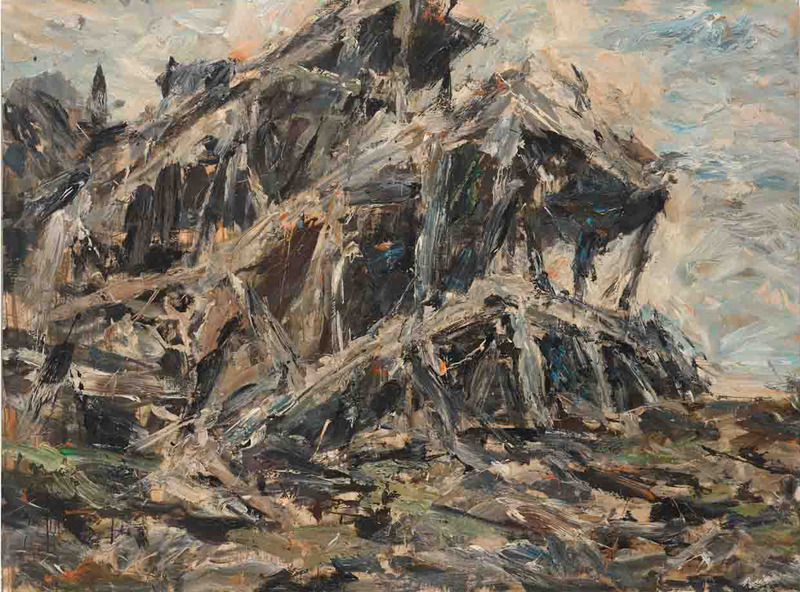 Kieffer's works have addressed subjects of desolation, destruction and creation. His choice of materials is vast, and their handling is visceral. They often jump out of the canvas: sand, canvas, concrete staircases, glass and hair. As Simon Schama, the great Historian and art writer exclaimed: "Not since Picasso's ‘Guernica’ have pictures demanded so urgently that we studiously reflect and recollect in their presence." Baalbaki at the moment chooses to frame his oeuvre succinctly, without great fanfare or perspective. He is a conciliator like DanteAmro Alighieri, and not a rouser. He bore witness to too many wars and conflicts, and wishes to unveil his thoughts and turban very carefully.